Matt Johnson grew up in North Aurora, Illinois. He received an NROTC scholarship as a walk-on college programmer while dual-enrolled at University of Minnesota and University of St. Thomas. He received his bachelor’s degree in Political Science at University of Illinois at Urbana-Champaign and commissioned as a 2nd Lieutenant in the Marine Corps in 2011. He served as a Platoon Commander with Company D, 3d Assault Amphibian Battalion in Twentynine Palms, California; deploying to the Far East in 2013. In 2014, he deployed to Kuwait and Iraq with the Special Purpose Marine-Air Ground Task Force as a Current Operations Officer and Senior Watch Officer. 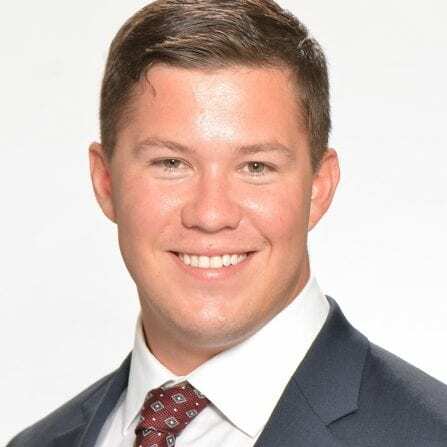 He then served as an Operations Officer and Series Commander at Marine Corps Recruit Depot San Diego before leaving active duty to attend the University of Chicago Booth School of Business and pursue a career in management consulting. Matt is an avid traveler, craft beer enthusiast, and fantasy football guru.